The Kogan Agora Pro has popped up in Australia as the latest Android handset and is available for international pre-order. 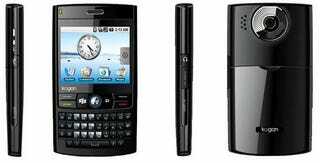 The phone has a 2.5-inch resistive touchscreen, QWERTY keyboard, 3G and GPS for $399. MELBOURNE, Thursday 4th December 2008 – Kogan Technologies today unveiled the Kogan Agora, the first Australian mobile phone powered by the Android™ operating system. Kogan Technologies will sell the Agora for AU$299 and the Agora Pro for AU$399. Both models are available for sale today on www.kogan.com.au. The phones are sold outright – with no contract – and will work on any network. The Kogan Agora (AU$299) features a full QWERTY keyboard, central navigation key, 2.5" touchscreen, microSD slot, and 3G connectivity. The Kogan Agora Pro (AU$399) adds a 2 MP camera, Wi-Fi, and GPS to the Agora's impressive specifications. Both models will ship to customers – in Australia and internationally – on January 29th 2009. Kogan Technologies founder, Ruslan Kogan, said the Agora is proof that his company is achieving its goal of offering the latest technology at the best value prices. "The Kogan team have been working very hard to bring out the exciting new phones powered by Google's Android operating system at the right mix of price and specifications," Kogan said. "We've been listening to customers through our blog, and crammed in all the features we possibly could. The end result is the best value, fully-featured phone in the Australian market. "We worked closely with manufacturers and vendors to develop drivers, software, and tweaks to make the Agora an intuitive and exciting experience for everyone. "The design and features of the Kogan Agora makes the phone appeal to both consumers and business users. "The Android operating system means the handset can capture and play music, photos and video, surf the web, play games, navigate, and organise your life with extremely powerful applications." Kogan has been a long time supporter of open source and Android™ provides a real alternative to Apple's proprietary operating system for the iPhone. "Google is a key player in developing efficient and innovative online solutions for customers around the world. The open source nature of Android means the operating system will continually improve over time," Kogan said. Google Search™, Gmail™, YouTube™, Google Maps™, Google Talk™, Google Calendar™. Other than as described in this release, Kogan and its products, are not affiliated with Google Inc or its products. Google™, Android™, Google Search™, Gmail™, YouTube™, Google Maps™, Google Talk™, Google Calendar™ are trademarks of Google Inc. Use of these trademarks is subject to Google Permissions. Kogan Technologies is a wholly-owned Australian company established in 2006 by entrepreneur Ruslan Kogan. Kogan sells a wide range of consumer electronics in Australia, New Zealand, and around the world. The Kogan promise is based on a unique business model that passes the savings of dealing direct with the manufacturers onto Australian consumers. Bypassing middlemen, Kogan is able to offer the latest technology at the most affordable prices. Kogan's unique blend of quality technology and value for money offers price-conscious Australian technology consumers a real choice.